Whether or not your little ones look to be future superstars, organized sports can be an important part of learning and growing up. Aside from the health benefits that staying active offers kids, games ranging from baseball to badminton provide children with a number of valuable lessons and skills they need for life. 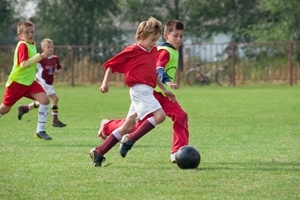 Here are three reasons why sports are great for kids. Sports of all kinds offer children a chance to develop social skills like making new friends, working together and supporting struggling teammates. Even single-player games like tennis or golf require kids to work with a coach or trainer. As a result, children can learn how to effectively interact with their peers on the field or court. With video games, TV, computers and smartphones in the mix, kids have more reasons than ever to avoid going outside. Signing your children up for a local little league team or intramural soccer league can be a fun and structured way to introduce your children to regular physical activity and fresh air. While winning is certainly more desirable, sports teach children an important part of growing up: learning how to lose. Kids will be better prepared for future successes and setbacks when they appreciate at an early age the importance of picking yourself up and dusting yourself off after a hard loss.